Recently granted patents show a shopping cart that monitors your heart rate, Alexa listening for coughs. Amazon and Walmart have both recently been granted patents for novel uses of biometric sensing — Amazon for an Alexa feature that would allow the device to passively detect signs of illness and recommend remedies and Walmart for a connected shopping cart handle that can detect heart rate, palm temperature, grip force, and walking speed. Companies, especially large, over-resourced companies like Amazon and Walmart, often receive patent applications that never become commercial products. But some patents do come to pass and they can be useful as an indicator of what companies are thinking about for the future. Will Dr. Alexa offer up un-asked-for prescriptions? 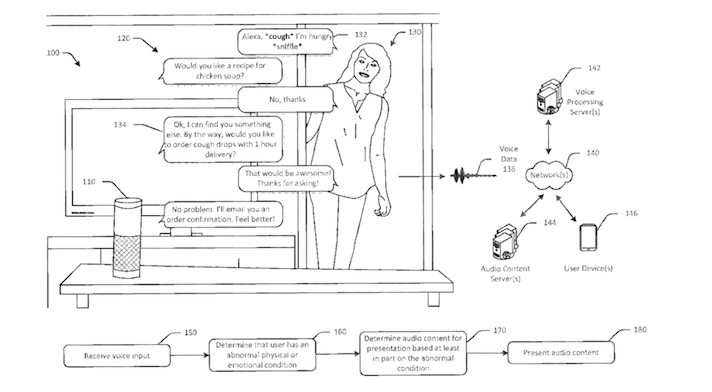 "For example, the voice interaction device may determine that the user coughed while uttering the phrase, and/or that the user sniffled after completion of the phrase," the patent reads. "A current physical and/or emotional condition of the user may facilitate the ability to provide highly targeted audio content, such as audio advertisements or promotions, to the user. In FIG. 1, the voice interaction device 110 may optionally determine a follow-up inquiry of 'would you like a recipe for chicken soup?' in response to the user's utterance regarding hunger." Maybe when Alexa notices the user has a cold, she'll offer up a recipe. But maybe not. "In the example of FIG. 1, Panera Bread may be interested in presenting an audio advertisement to the user ," the document goes on. "As a result, the follow-up inquiry of 'would you like to order chicken soup?' may be directed towards determining whether the user is a target consumer for receiving a Panera Bread audio advertisement." Further down in the example, after the user declines the offer of chicken soup, Alexa asks "By the way, would you like to order cough drops with 1 hour delivery?" Will Walmart's carts know you better than you know yourself? Walmart's patent, "System and method for a biometric feedback cart handle" provides a similar kind of passive monitoring, though the use of biometrics goes well beyond healthcare. It lays out a number of ways a connected, sensor-laden cart handle could learn things about consumers, which could then facilitate store associates in finding them and offering different kinds of assistance. "The server can, over time, build a table of the data associated with a customer's visit to the store, the table being made of the biometric data and/or the non-biometric cart data. Specifically, as the data is received the data can be recorded and added to the table. In addition, within the table can be values and data extrapolations based on the other data," the patent says. "For example, the server can create, within the table, a metric for the customer's stress. This stress estimate can, for example, be calculated by weighting the biometric and non-biometric factors. As one example, if a customer's temperature is increasing while the customer's grip on the shopping cart handle simultaneously increases in force, the stress estimate may increase." Exactly how the readings will be used is less clear from the patent. It suggests that the data could be used in aggregate to improve te overall shopping experience; i.e. if shoppers habitually become stressed out in a particular aisle there may be something wrong with the display or traffic patterns. More specifically, it could be used to anticipate the needs of frustrated shoppers or even contact emergency services in light of especially aberrant readings (the patent doesn't specify, but one could imagine a seizure or cardiac arrest being identifiable based on the noted biometrics). How much data collection is too much? Amazon's voice activation features are already being used for healthcare purposes in a number of different ways. But there's a big difference between seeking out healthcare from Alexa and having her diagnose you on the fly based on a cough. Some consumers might welcome the move toward making the voice assistant more human-like, but others may well consider un-asked-for biometric monitoring of any kind beyond the pail. And as for Walmart, Target already faced controversy years ago when the New York Times reported the story of its coupon algorithms figuring out a teenage girl was pregnant before her parents knew. The incident, and the ensuing response, demonstrated the limits to most customers' willingness to be monitored by retailers. But retailers continue to seek out the competitive edges that more and more data on customers can bring. These patents may be years off from becoming commercial products, if they ever see the light of day. But the trend they represent seems inevitable. If information about a person, even health information, can be detected passively, the likes of Amazon and Walmart will know it eventually.